^ Aristotle, History of Animals, 578b27 Archived 2007-10-13 at the Wayback Machine Archived 2007-10-13 at the Wayback Machine; cf. 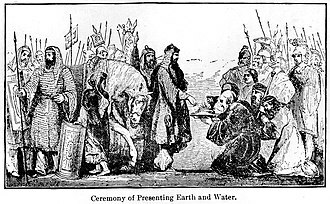 John & William Langhorne, Plutarch's Lives (1819), vol. 2, p. 172, n. 99. Kahn, C. (1994). 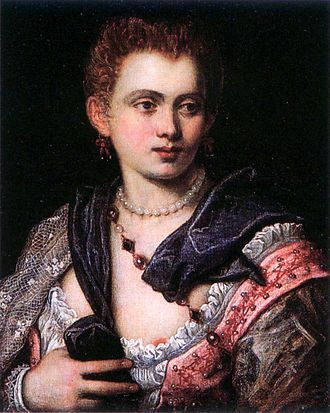 "Aeschines on Socratic Eros". In Paul A. Vander Waerdt. 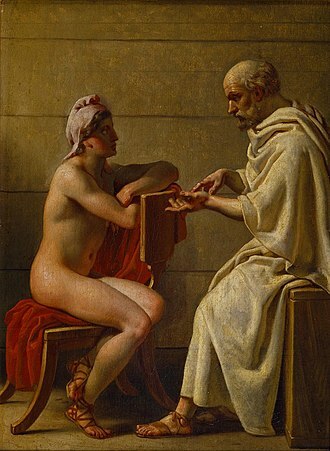 The Socratic Movement. Cornell University Press. ISBN 978-0-8014-9903-6. A trireme was an ancient vessel and a type of galley that was used by the ancient maritime civilizations of the Mediterranean, especially the Phoenicians, ancient Greeks and Romans. 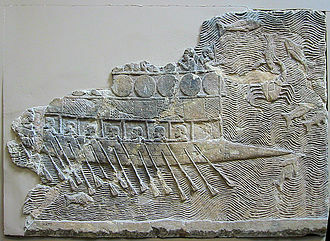 The trireme derives its name from its three rows of oars, manned with one man per oar. The early trireme was a development of the penteconter, an ancient warship with a row of 25 oars on each side, and of the bireme. 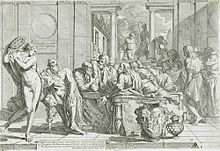 The word dieres does not appear until the Roman period and it must be assumed the term pentekontor covered the two-level type. 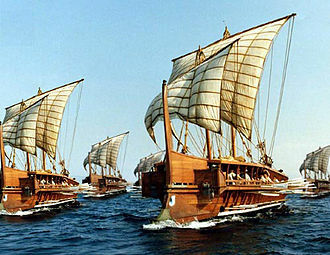 Triremes played a role in the Persian Wars, the creation of the Athenian maritime empire. The term is used to refer to medieval and early modern galleys with three files of oarsmen per side as triremes. Fragments from an 8th-century relief at the Assyrian capital of Nineveh depicting the fleets of Tyre and Sidon show ships with rams and they have been interpreted as two-decked warships, and as triremes. 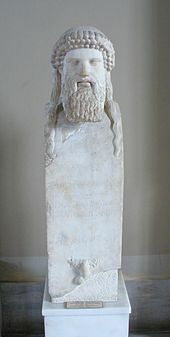 Modern scholarship is divided on the provenance of the trireme, Greece or Phoenicia, clement of Alexandria in the 2nd century, drawing on earlier works, explicitly attributes the invention of the trireme to the Sidonians. According to Thucydides, the trireme was introduced to Greece by the Corinthians in the late 8th century BC, and the Corinthian Ameinocles built four such ships for the Samians. 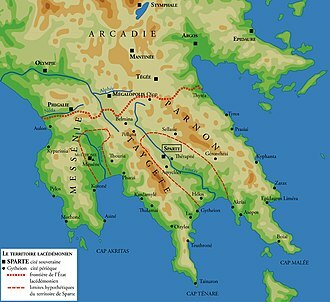 This was interpreted by writers and Diodorus, to mean that triremes were invented in Corinth, Thucydides meanwhile clearly states that in the time of the Persian Wars, the majority of the Greek navies consisted of penteconters and ploia makrá. 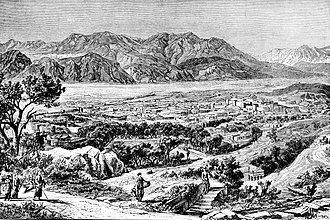 Athens was at that time embroiled in a conflict with the island of Aegina. 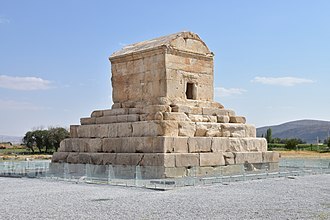 The first clash with the Persian navy was at the Battle of Artemisium, the decisive naval clash occurred at Salamis, where Xerxes invasion fleet was decisively defeated. 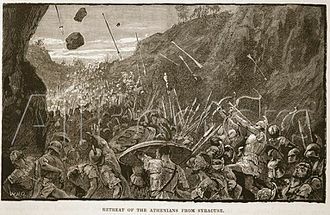 After Salamis and another Greek victory over the Persian fleet at Mycale, the Ionian cities were freed, the predominance of Athens turned the League effectively into an Athenian Empire. 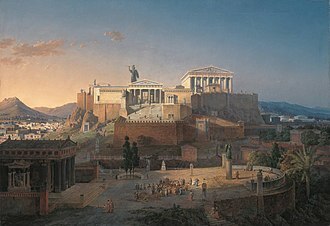 The source and foundation of Athens power was her strong fleet, in addition, as it provided permanent employment for the citys poorer citizens, the fleet played an important role in maintaining and promoting the radical Athenian form of democracy. 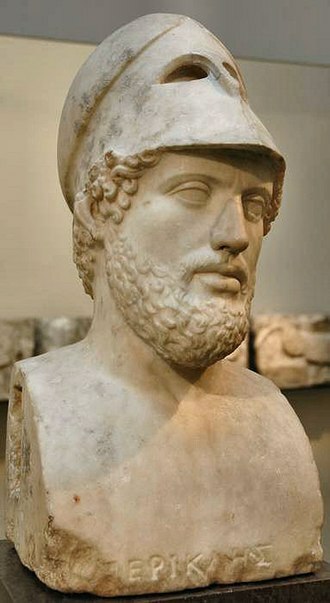 Cleisthenes was a noble Athenian of the Alcmaeonid family. 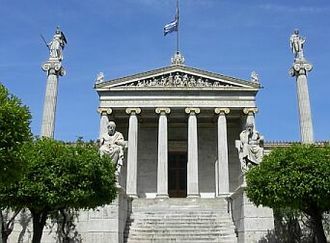 He is credited with reforming the constitution of ancient Athens and setting it on a footing in 508/7 BC. 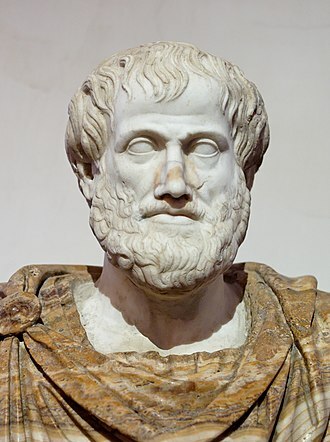 For these accomplishments, historians refer to him as the father of Athenian democracy and he was the maternal grandson of the tyrant Cleisthenes of Sicyon, as the younger son of the latters daughter Agariste and her husband Megacles. Also, he was credited with increasing the power of the Athenian citizens’ assembly, historians estimate that Cleisthenes was born around 570 BC. 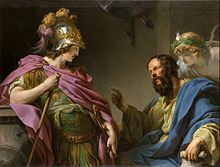 Cleisthenes was the uncle of Pericles mother Agariste and of Alcibiades maternal grandfather Megacles, with help from the Alcmaeonidae, he was responsible for overthrowing Hippias, the tyrant son of Pisistratus. 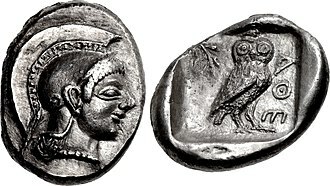 After the collapse of Hippias tyranny and Cleisthenes were rivals for power and he did so on the pretext of the Alcmaeonid curse. 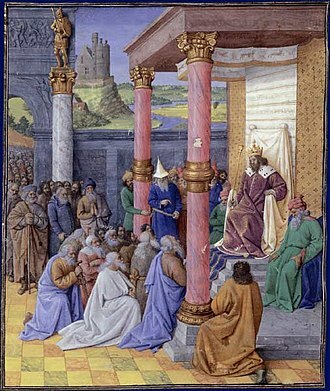 Consequently, Cleisthenes left Athens as an exile, and Isagoras was unrivalled in power within the city, Isagoras set about dispossessing hundreds of Athenians of their homes and exiling them on the pretext that they too were cursed. 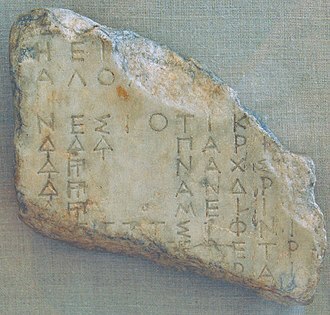 He attempted to dissolve the Boule, a council of Athenian citizens appointed to run the affairs of the city. 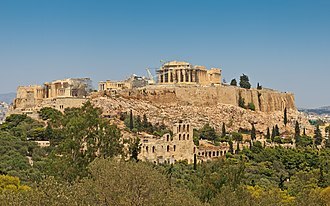 However, the council resisted, and the Athenian people declared their support of the council and his supporters were forced to flee to the Acropolis, remaining besieged there for two days. 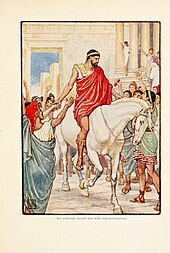 On the third day they fled the city and were banished, Cleisthenes was subsequently recalled, along with hundreds of exiles, and he assumed leadership of Athens. 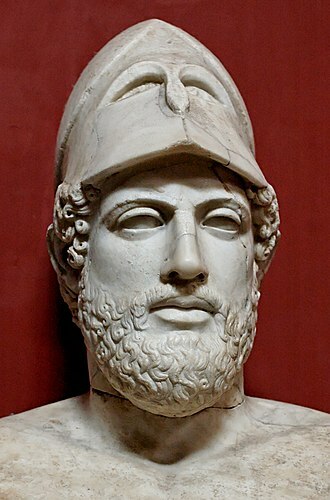 After this victory, Cleisthenes began to reform the government of Athens and he commissioned a bronze memorial from the sculptor Antenor in honor of the lovers and tyrannicides Harmodius and Aristogeiton, whom Hippias had executed. 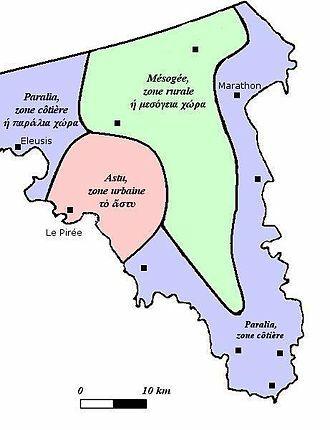 It is thought there may have been 139 demes which were organized into three groups called trittyes, with ten demes divided among three regions in each trittyes. 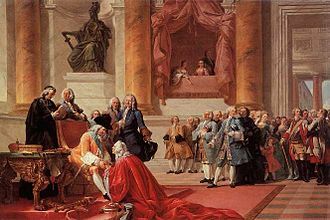 Cleisthenes abolished patronymics in favour of demonymics, thus increasing Athenians sense of belonging to a deme and he established sortition - the random selection of citizens to fill government positions rather than kinship or heredity, a true test of real democracy. 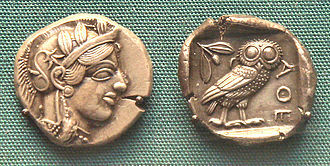 Ajax or Aias is a mythological Greek hero, the son of King Telamon and Periboea, and the half-brother of Teucer. 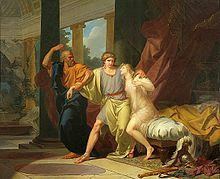 He plays an important role, and is portrayed as a figure and a warrior of great courage in Homers Iliad and in the Epic Cycle. 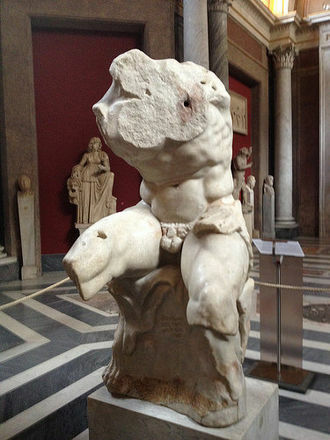 He is referred to as Telamonian Ajax, Greater Ajax, or Ajax the Great, in Etruscan mythology, he is known as Aivas Tlamunus. 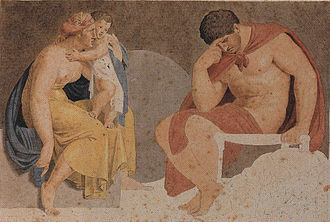 Ajax is the son of Telamon, who was the son of Aeacus and grandson of Zeus and he is the cousin of Achilles, and is the elder half-brother of Teucer. 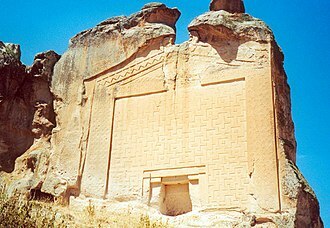 Many illustrious Athenians, including Cimon, Miltiades and the historian Thucydides, the Italian scholar Maggiani recently showed that on an Etruscan tomb dedicated to Racvi Satlnei in Bologna there is a writing that says, aivastelmunsl = family of Telamonian Ajax. 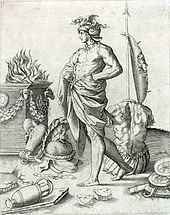 In Homers Iliad he is described as of great stature, colossal frame, known as the bulwark of the Achaeans, he was trained by the centaur Chiron, at the same time as Achilles. He was described as fearless and powerful but with a high level of combat intelligence. 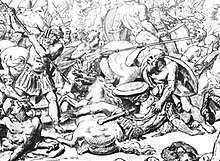 Ajax commands his army wielding a shield made of seven cow-hides with a layer of bronze. 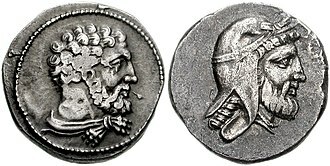 Unlike Diomedes and Achilles, Ajax appears as a mainly defensive warrior, instrumental in the defence of the Greek camp and ships, when the Trojans are on the offensive, he is often seen covering the retreat of the Achaeans. 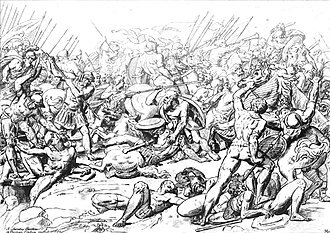 Significantly, while one of the deadliest heroes in the whole poem, in the Iliad, Ajax is notable for his abundant strength and courage, seen particularly in two fights with Hector. 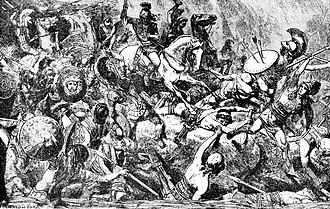 In Book 7, Ajax is chosen by lot to meet Hector in a duel which lasts most of a whole day, the second fight between Ajax and Hector occurs when the latter breaks into the Mycenaean camp, and fights with the Greeks among the ships. 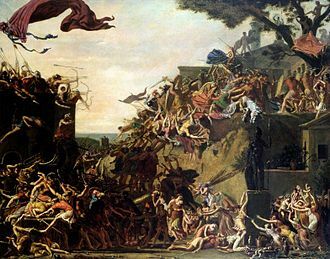 In Book 14, Ajax throws a giant rock at Hector which almost kills him, in Book 15, Hector is restored to his strength by Apollo and returns to attack the ships. Ajax, wielding a spear as a weapon and leaping from ship to ship. 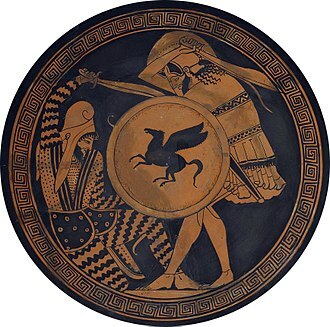 In Book 16, Hector and Ajax duel once again, Hector disarms Ajax and Ajax is forced to retreat, seeing that Zeus is clearly favoring Hector. Jupiter and Mercurius in the House of Philemon and Baucis (1630–33) by the workshop of Rubens: Zeus and Hermes, testing a village's practice of hospitality, were received only by Baucis and Philemon, who were rewarded while their neighbors were punished.